T. George Davis was elected to a six-year term as clerk of the superior court for Dukes County. 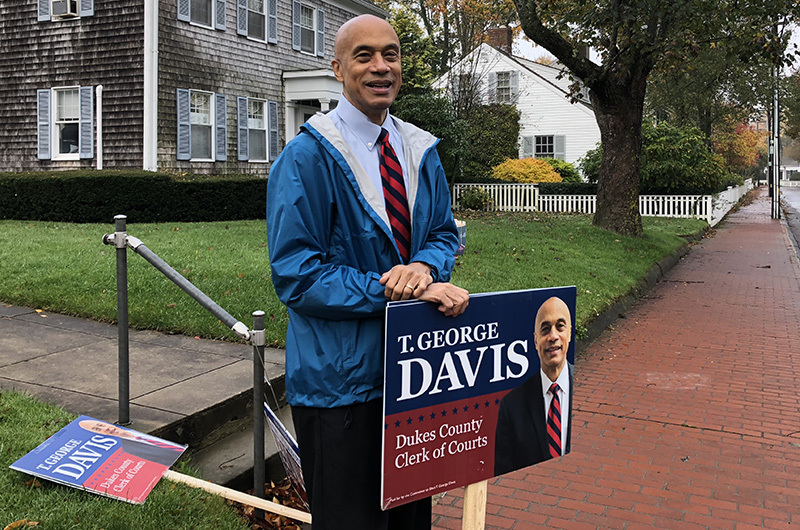 Turning out in large numbers Tuesday alongside their counterparts around the state and country, Vineyard voters elected a new clerk for the superior court and a slate for the Dukes County commission that includes an 18-year-old from Edgartown. Vineyard Haven attorney T. George Davis will take the baton from retiring longtime court clerk Joseph E. Sollitto Jr. in January. Mr. Davis, a Democrat, prevailed by a wide margin over his opponent Anthony Piland, a physician’s assistant also from Vineyard Haven, who ran as an unenrolled candidate. According to unofficial results from all Island towns (Aquinnah and Chilmark came in just before midnight), Mr. Davis won all six Island towns and the town of Gosnold with a total of 7,563 votes over 2,128 votes for Mr. Piland. In the only other contested local race, seven county commissioners were elected — five incumbents and two newcomers. Keith Chatinover, a recent graduate of the Martha’s Vineyard Public Charter School who will enroll at Middlebury College this winter, was elected to a seat along with John Cahill. Also elected were incumbents John Alley, Christine Todd, Gretchen Underwood, Leon Brathwaite and Tristan Israel. Incumbent Robert Zeltzer lost his seat by seven votes to Mr. Israel. Island voters also helped reelect Cape and Islands state Sen. Julian Cyr, a Truro Democrat, to a second term by a wide margin. Mirroring the heated electoral mood around the state and the country, voting was heavy from morning to night at every Island polling station. Total turnout in every Island town was 64 per cent or higher, with West Tisbury topping out at 75 per cent. Turnout on Gosnold, the seventh town in Dukes County made up of the Elizabeth islands, was 44 per cent. In Oak Bluffs the line started early and remained out the door all day. In Aquinnah, the Island’s smallest town, turnout reached 72 per cent, with 267 of the 371 registered voters casting ballots. “I hope this is one example of what’s happening in small communities around the country, letting them know that we count,” said longtime Aquinnah resident Len Butler. In Tisbury poll worker Ken Eber reported seeing many first-time voters. “One thing they all have in common is they are all very excited and seem to be very interested in this election and believe their vote is important,” he said. “No lull,” Tisbury town clerk Hillary Conklin said, describing the turnout. Early in the day the automatic voting machine was temperamental, and Ms. Conklin scrambled to fix the problem and keep the peace as voters lined up around the public safety building, paper ballots in hand. Later on after the polls closed, counting was delayed while all the ballots from early voting were fed into the overworked machine. In Edgartown, Wanda Williams was watching over the ballot box in her last election as town clerk. Ms. Williams will retire on Nov. 30. “This has been a really busy day,” the longtime town clerk said, predicting that the turnout would surpass the 2016 presidential election. In other key issues, Vineyard voters narrowly rejected Question 1, the state ballot initiative to limit the nurse-patient ratio in hospitals, by a vote of 4699 in favor and 5090 against. The measure was soundly defeated statewide. Island voters also joined with the rest of the state in voting overwhelmingly to keep laws intact to protect the rights of people who are transgender. Election day weather was mild and blustery with drizzle, fog and light rain. Early-morning voters who cast ballots spoke out. “I voted because I felt we need a change, and this is my opportunity,” said Chris Rasmussen in Tisbury. “I think we’ve seen where apathy gets us,” said Molly Kiely who was voting for the first time in Massachusetts. “I vote in every election. You can’t complain if you don’t vote. Well, you can, but not with a clean conscience,” said Davies Millett. Aquinnah, 267 voters, 371 registered, 72 per cent turnout. Chilmark, 729 voters, 1,006 registered, 72 per cent turnout. Edgartown, 2,391 voters, 3,722 registered, 64 per cent turnout. Oak Bluffs, 2,565 voters, 3,907 registered, 65 per cent turnout. Tisbury, 2,290 voters, 3,446 registered, 66 per cent turnout. West Tisbury, 1,904 voted, 2,566 registered, 74 per cent turnout. Landry Harlan, Holly Pretsky, Steve Myrick, Noah Asimow and Bill Eville contributed reporting. Congratulations on a well run campaign. I know you'll do a great job. Congrats to all! Especially George Davis and Keith Chatinover! Rest and recover for a bit, everyone. Then it's back to work for 2020!!! Terrific turn out both locally and nationally. Nationwide an incredible win for Republicans!